I was four years-old. I remember sitting alone near the door of my bedroom, attempting to read Judy Blume’s, Freckle Juice. My mom had taught me how to sound out letters from the alphabet a few weeks prior and since then, I was eager to read. After a few minutes of difficulty, without the help of my mom, the sounds from each letter on the pages of the book began to form into words. Words that inspired me to read more. Words that inspired me to appreciate literature. Nowadays, whenever I pick up a book, I cannot help but remember my first ever moments of reading, and how sophisticated my taste in literature has become. I am still puzzled as to how I went from reading books by Judy Blume, to books by William Faulkner! Anyway, you may be wondering what my first memory of reading has to do with the Jamaican Beef Patties recipe I am sharing with you today. Well, this recipe is one that captures a memory from my past- a memory of the first time I attempted to bake something- one of the first dishes I had ever baked. Why Jamaican beef patties? Well, besides the fact that the homemade kind always tastes amazing, and besides the fact that my aunt G and I wanted to make beef patties (did I mention she’s Jamaican? ), I wanted to make something that challenged me to cook and bake at the same time. And damn, my six year-old self was freakin’ good at it! Anyway… The beef patties recipe. My version of these amazing meat pastries is to die for. The pastry itself is very flaky and doesn’t get soggy, even after you re-heat the pastries in the microwave as a midnight snack. Yes, that’s a big A+ in my book- if the pastry can withstand the torture of a microwave, I’m a very happy camper! So, what’s the secret to the very flaky pastry? Fraisage! It’s a technique used to create alternating layers of butter and dough in pastry, simply by just smearing a shaggy mess of dough and butter, with the heel of your hand (I have seen people use dough scrapers and spatulas to perform this step, but I prefer the traditional method- the method that saves me from washing another dish!). In addition to amazing flaky pastry, the filling in each beef patty is just as amazing and has a small kick of spice to it (it’s not that bad- I really promise! ), which you will also appreciate! So, what was the first dish that you every cooked / baked? – Combine the flour, turmeric powder, and salt in a large bowl. Add butter. – Using your fingertips, rub the butter and flour together. When the butter is the size of chickpeas, add the ice water just until the dough comes together. 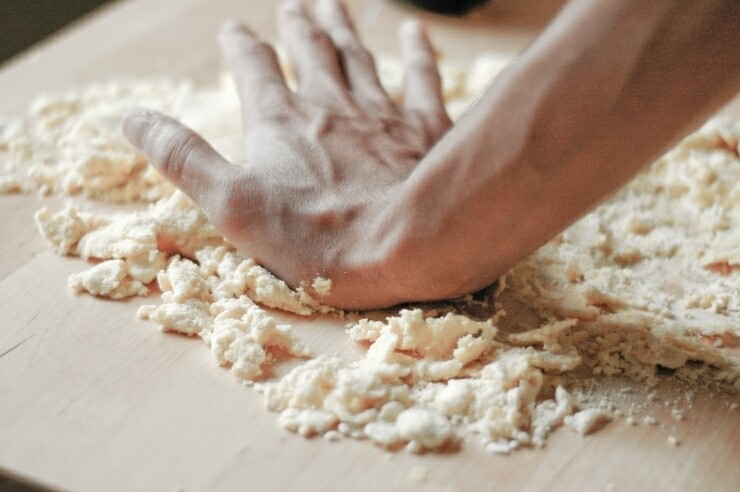 – Drop the dough (it will be a shaggy mess with many large chunks of butter coated in flour) onto a floured work surface. 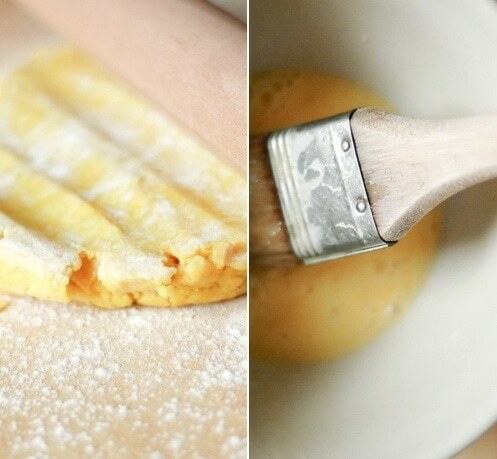 Using the palm of your hand, smear the butter and flour from one end of the pile of dough to the opposite end. Repeat this step until a structured dough forms (shouldn’t have chunks of butter showing, and it should not be a shaggy mess). 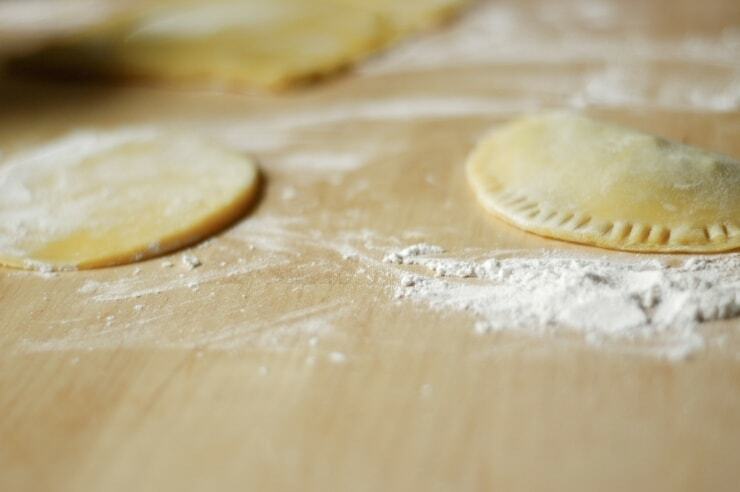 – Form the dough into a disk, wrap in plastic wrap and refrigerate, while you make the filling (procedure follows). – Mix thyme, chili powder, rosemary and hot sauce in a small bowl. Add to the ground beef and mix. – Heat oil in a deep skillet over medium heat. – Add bell pepper and onions. – Cook, stirring until softened, but not browned. – Add beef, breaking up any clumps. – Add enough water just to cover the meat (kamran note: I used ½ cup). 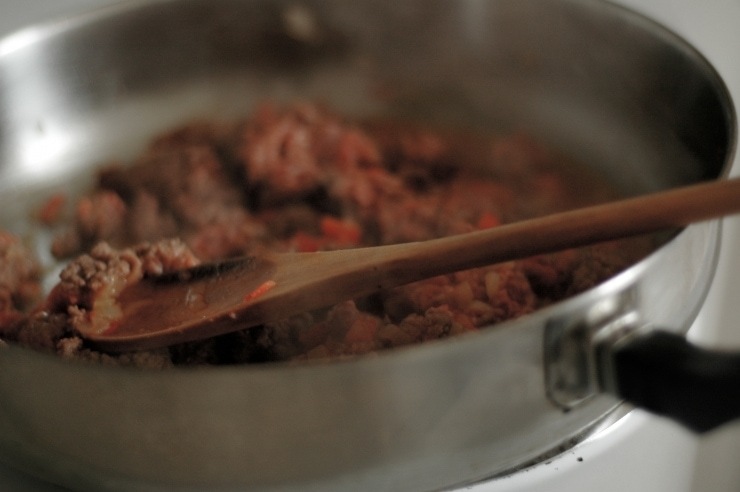 – Simmer for 24 minutes to ½ hour, until the meat is soft and the water has reduced to a sauce. – Set meat mixture aside and cool. – Preheat oven to 375ºF. – Remove the disk of dough from the refrigerator, and divide it in half. Roll out the dough on a floured surface until there is enough space for 6 circles to be cut (each about 5 inches across). You may need to re-roll the scraps to make all 6 patties. – Once the filling has cooled completely, have a bowl of water and a fork on hand. Place about 1 ½ tablespoons of filling on the lower half of each circle of dough. Dip a finger into the water, and moisten the edge of the dough. Fold the top half over, pulling the dough gently. Crimp the edge with a fork, and transfer to a parchment-lined baking sheet. Repeat with remaining dough and filling. Brush each pastry (optional) with an egg wash. Bake for 22 to 25 minutes, until top crust is firm and golden. Serve warm. This is one of my favorite posts from you! I love your writing style and everything about your photos! Keep up the great work! What a wonderful recipe memory. Judy Blume! Woohoo! I’m amazed you remember your first book – I only remember teaching my brother to read. I spent hours with him, helping him sound out those words. Your first food memory – I love it. What a fun thing to do with your aunt (my aunt taught me how to make pastry – pie crusts – too! ), learning something as lovely as these :). My first food memory was chocolate chip cookies, standing on a chair helping mom stir and measure out the ingredients :). Lauren – it was my favorite book, that’s why. :) I still have it. It is currently lost between other books on my bookshelf. These look and sound amazing! I am intrigued by the flaky crust – this is a must make! They look great!! A bit like a Jamaican empanada :) I love your composition choice in the top photo – I always have such a hard time with square pics, and it’s so simple and clean and bright. I’m already thinking about everything else I can do with that pastry dough—so light and flaky looking. That’s the hardest part of focusing in the kitchen—thinking of all the other recipes yet to come. I have some clients that absolutely love these. I’d love to try my hand at them. Your childhood is like yesterday? I laughed because it was yesterday. Just kidding. What I appreciate about this post is not just the good writing, but a comfort food recipe that still seems light enough to eat in this sweltering heat. I love food that you can pick up with your hands, and these flaky little pies seem irresistible. There’s an Indian dessert just like these beef patties called gujhiya. Just the filling is different, its sweet. But this one here looks even better! Emily S – It’s a good thing that you asked that! I am making these again with 1/2 tspn of curry powder in the dough mixture, to see how they come out. If you’re looking for color, I wouldn’t sub the full amount of turmeric with curry powder, as curry powder has strong flavor and I think that the amount of turmeric in curry powder isn’t really enough to give the dough that signature yellow color. So, if you’re not looking for color, I’d leave the turmeric out and add in the curry powder for the flavor, just so you have something to compensate for the color loss. Hope I answered your question! Oh, and yumm to the cookie dough!! Angela – Thanks for the kind comment and the good laugh! These babies are absolutely irresistible! i love this post. i usaully read your blog but don’t comment; but this post was so lovely i decided to commetnt. My children are multicultural (i am indian-american my husband italian/irish american) and i love hearing about your multicultural life. I’m from Australia and was wondering what hot sauce is. Thanks for sharing so much with the world…your life…your fabulous recipes…it is truly appreciated. Regards from the land down-under. Angela– thanks to the help of one of my foodie friends in Australia, I found out what you all call hot sauce “pepper sauce.” She told me that it’s only really found at imported stores (she says) and she also said that there isn’t really an equivalent in Australia! So, if you want a bit of heat, I think I would just chop up a little bit of pepper, and add it to the recipe… Hope that helps! Hi Kamran, this is my first comment on your site! I felt like I needed to comment on this post because I loved it alot! I have to say to you, as a Jamaican, how much I appreciate the authenticity of your recipe and how much I love what your aunty said about how to season the filler of the pastry. Wonderful post, Kamran! My mum grew up in Jamaica, so these beef patties also hold a special place in my heart. Her grandparents grew allspice on their property, so we are always sure to season ours with plenty of it. I love your aunt’s advice about seasoning however you want to suit your tastes. I’m with Cynthia… this is a fantastic post. And, my kids would actually love this recipe. You can bet I’m trying it out ASAP! I love your vivid memory of your first time reading, Kamran. A great head full of memories is a wonderful thing to have! Very nice post. My stepson used to have me buy these frozen for him. I know he would much have preferred these! My husband loves Jamaican beef patties! He always buys those freaky frozen ones that are horrible for you. He would die of happiness if i made these for him. These look so good. I love beef patties sometimes when I am lazy I just buy puff pastry and put the meat in them. I am sure you can sprinkle some tumeric on it to make it taste more authentic. I had these in Grand Cayman, served with Pickapeppa sauce. Standard bar fare around lunch time. Goes great with a Red Stripe. Looks like curry puffs! YUM! Lovely post! And that first photo just grabs me! Your photos and writing style are exquisite! 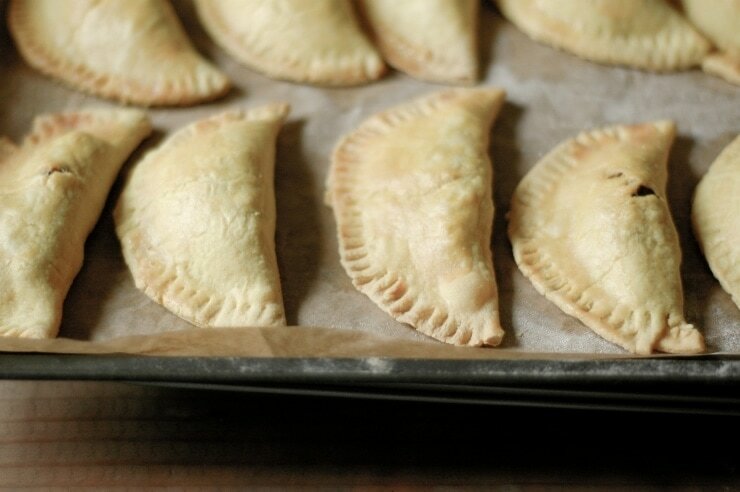 These patties looks scrumptious, and the pie crust looks amazing. I am definitely bookmarking this recipe. Thank you for sharing this recipe and your childhood memories. I like your Aunt G, she’s a smart practical women. I also would love to try your Jamaican patties, they look fantastic. Powling– people pay $50 for some really expensive puff pastry! I have recently been making my own puff pastry because it’s fun, and because it tastes better. As for sprinkling on the turmeric, it’s not going to really do much because it’s in there for the color- not really the taste. Very nice! Thanks for the detailed recipe. I love Jamaican food. These look great! Love the memories behind the dish, too. I’m sure this is a recipe I’d love… I’m a huge fan of Jamaican food. I just ate dinner, but I’m starting to feel hungry again. These patties look to die for! When I was a teenager I had a job and I had to make hundreds of empanadas at a times, so I love that the Jamaican version is baked. Cheers! First time to your site and it’s great. I love that show it’s possible to take stunning pictures without any sophisticated camera gear. Wow! Just found your site and your photographs are so beautiful! I just subscribed :) cant wait to see and read more! My first and only experience with Jamaican beef patties was as school lunch that left my stomach…less than happy. And so I’ve avoided them like the plague since second grade. But I think it’s time they made a comeback in my life. These look delicious! These look awesome! And, yes, I loved Freckle Juice, too! Isn’t it amazing how much we remember about those pivotal moments in our lives? I have so many memories like the ones you described here that have greatly influenced my cooking. Beautiful post and great recipe, Kamran! These sound and look like my mother in law’s meat pies. We made them one Christmas when I was visiting, but I can’t remember what seasonings we put in with the meat. Thanks for sharing!! I’m bookmarking and can’t wait to make these. My hubby will love them!! I am so happy to have found this recipe!! I love Jamaican patty’s and always feel so guilty buying the ones on the street so I have been looking to make my own. Will definitely try this recipe! Maybe will even try my hand at a jerk or curry chicken too! These look amazing! Better than Golden Krust I’m sure! Firstly I LOVE this site. I’m a part time stay at home mum and when the housework seems to much and everyone is down for their lunch time nap – I love nothing more than getting a recipe from here and having a go. Plus when Daddy comes home there is always something yummy ready. These are one of our favourite. I know this is cheating a bit BUT we used the Reggae Reggae sauce that was featured on dragon’s den (we are in the UK) and it is AMAZING. You get such a yummy taste out of it mixed with some tabasco and marmite as well!! Yum Yum. I am so glad I came across this website. A childhood memory of making beef patties with my father(he was Jamaican) came to me. I googled Jamaican beef patties to see if my childhood memory of the recipe was right and it was! We made ours a little different but as you said,what does it matter if it taste good! Thanks for sharing!! Happy to fine this recipe really love jamacain beef patties. 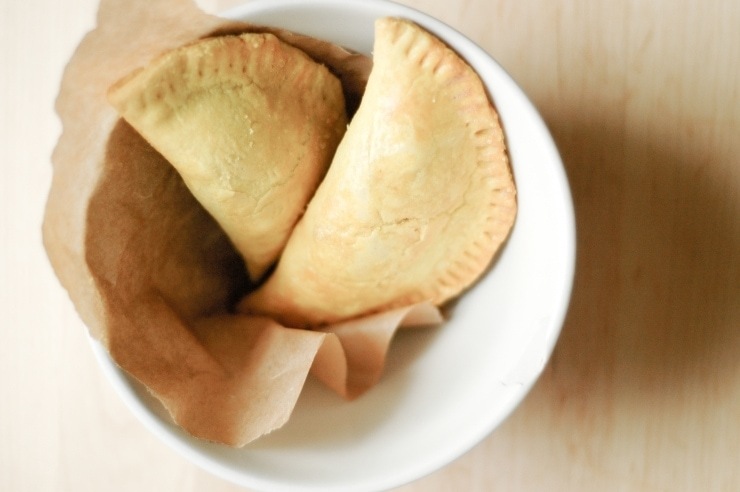 As Jamaicans abroad, we recognize the need to start making our own Jamaican patties! This is a lovely post and really inspires us to really go for it! We should keep in touch! Will bookmark. Is there anything better than having a Jamaican aunty who cooks well?!?!? Except for the turmeric this is how I make my pie crust.They make and sell pies similar to these in Louisiana and I love them.The spices used are different of course. My first thing to cook alone was pot roasted chicken.I was 9 and parents were gone,we 4 kids were hungry and there was a thawed chicken.I just started doing what I had seen my gramma do and I knew it better be good because I was going to be in trouble anyway for cooking.lol My parents were amazed at what I had done.I was lectured but was asked to make this dish once a week for dinner.I found what I was good at and loved it.I owe it to both my gramma’s in heaven. I made these last night and they were delicious! I did add to the recipe some tomato paste, garlic clove and cummin. I did find the salt in the dough to be a bit strong though and will lessen that ingredient next time. I have posted about this recipe on my family website and gave you credit as the source. I hope that’s okay? I love your website, thank you! Oh yes, the reason I found your website in the first place is because my neighbor asked me to do a search for a Jamaican beef pattie recipe for him. You’re welcome! Yes, I only had regular table salt….I do have some flake salt as well but I think I’ll stick to the table salt, but not add so much in next time. My neighbor made Johnny Cakes the other day and, oh my goodness they were good! :-) Have you heard of patties being made with chicken? Tastee patties. I could never duplicate the flakiness of the crust although they came out very well and delicious. I have been trying for years to find the perfect crust and I think I just did. Just finished making a triple batch and the pastry was SO satisfyingly crispy and flaky and messy that I nearly burst into song. My hubby and kids are suitably awed. Can’t wait to show these off. Will be giving you tons of cred. Thanks for this great recipe. I lived in Jamaica for a year and, like one of the previous commenters, I absolutely loved Tastee patties. I always thought you couldn’t make a proper pastry without shortening/lard. I was so wrong. I love that your recipe uses real butter. The only thing I did differently was I ran the cooked meat mixture through the food processor for a couple of seconds. It gave the meat filling that smooth consistency found in authentic Jamaican beef patties (and helps it distribute evenly when you assemble the patties for a neat and even look). This is probably a green question, but, when you mix the ground beef with the spices, before the 24 minute sauté, should it be raw or already browned at that point?